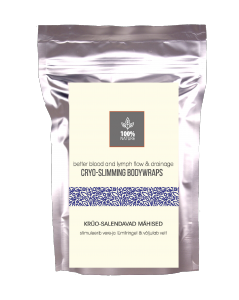 100% NATURAL body shaping concept – bandage wrappings impregnated with active substances on the basis of extracts of vegetable oils, minerals and microelements. Wrappings are one of the most popular and effective methods of body shaping and getting rid of cellulite, and also an effective assistant in a diet aimed at weight reduction for effective weight loss.Wrap products are an advanced solution for bodysculpting, based on combination of 100% pure and premium organic essential oils within the Patented Anti-Cellulite CO2 Complex and anti-cellulite substances of Dead Sea mud. Innovative blend promotes fat burning, reduces the appearance of cellulite, improves the skin texture and elasticity, and helps to remove excess fluid. Different combinations of natural essential oils in our products increases the blood flow and improves metabolism in the tissues, stimulating metabolic exchanges and oxygen consumption in the fat tissues and contrasts stagnation of liquids and toxins, main cause of the cellulite process. Each package contains 2 Disposable Pre-Soaked Bandages Ready-To-Wrap. Most reviews about bandage wrappings are positive. Women note an immediate and notable result after the first time – skin structure and relief improve, cellulite becomes less notable, extra kilograms and centimetres literally melt away. To achieve visible results, we recommend you to undergo a course of procedures that can be done in salon or at home by yourself. For best results, we recommend to combine wrappings with lymph drainage, massages or other similar procedures. Depending on the body size, the volumes can decrease from 2 to 6 cm in one procedure. We offer five different body wrappings and a body cream mask that stimulates lymph circulation, has a vessel-strengthening effect, activates metabolism, which contributes to intensive breakdown of fats and rapid weight loss. All products are 100% natural, without preservatives and flavours. – Detox-cellufree wraps for prevention and complex effect on all forms of cellulite, improve process of fat burning and detoxification, accelerate metabolism and remove excess water. Stimulate lymph drainage, remove metabolism wastes and toxins out of body due to fats metabolism. Ideal for fat cellulite, overweight and skin laxity. Easy cooling effect. Ingredients: water extract of Dead Sea mud, natural menthol, natural camphor, natural caffeine, peppermint oil, grapefruit oil, sweet orange oil. 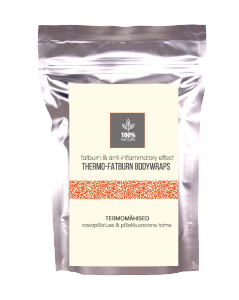 – Thermo-fatburn wraps affect the thicker layer of fat tissue, promote lipolytic processes in major cells of the adipose tissue where the cellulite occurs. For prevention and complex effect on all forms of cellulite. Used in programs to destroy a dense fat layer, the so-called fibrous cellulite – by its effect loosens a dense layer of fat tissue, while increase in volumes is possible directly after the procedure, then the volume goes away. The loosened layers can later be removed with a massage or other types of bandages. Improve process of fat burning and detoxification, accelerate metabolism and remove excess water, have a warming effect. Also used for radiculitis, osteochondritis and arthritis as an anti-inflammatory and analgesic. Ingredients: extract of Dead Sea mud, natural menthol, natural camphor, patent-ed formula of anti-cellulite CO2 complex, caffeine, essential oils: peppermint, grapefruit, sweet orange, lemon; extract of orange and CO2 extract of hot pepper. – Deep Heat Wraps: the synergy of different active components, sea algae and essential oils deeply warms up the dense layer of adipose tissue and fibrous cellulite, promotes lipolytic processes in major cells of the adipose tissue where the cellulite occurs. Heating effect activates blood circulation, lymph flow and accelerates natural fat metabolism, optimizing oxygenation and detoxification of the tissue. Heating wraps increases tissue elasticity and muscle relaxation, active components helps reduce inflammation and the buildup of fluid, removes waste and toxins from the body and stimulates fat metabolism on cellular level. Regular use of heating wraps reduces the appearance of cellulite and swelling, improves skin structure and tone, as well as its elasticity, helps to remove excess fluid, helping to lose weight. Due to its anti-inflammatory effect, it is ideal for radiculitis, arthritis and rheumatism, as well as for athletes. Best results will be achieved by combining DETOX and CRYO wraps in a treatment course. Active ingredients: thermal water; extracts of green, red and brown algae, Lanablue™, phytoplankton, SuperSlimBody complex, AntiCellulite CO2 complex; extracts of verbena, ivy, caffeine, horse chestnut, hot pepper, oregano, sage; phytoextract of oak moss; hyaluronic acid, essential oils: menthol, lemon, jasmine, santal and rosemary. – Cryo-detox wraps boosts the lymphatic system thanks to their strong cooling effect, enhances lymphatic drainage, strengthens the walls of the veins, improve skin texture and tone. For prevention and complex effect on all forms of cellulite, promote weight loss, have a strong lymph drainage effect. A strong freezing effect tones vessel walls and increases skin elasticity, improves process of fat burning and detoxification, accelerates metabolism and removes excess water. Can be used for varicose veins, for pregnant women with swelling in legs. Ingredients: Natural Dead Sea Mud Extract, natural menthol and camphor, collagen, allantoin, mixture of natural essential oils: peppermint, green mint and lemon. – Light-tonic wraps for prevention and complex effect on all forms of cellulite, promote weight loss, have a lymph drainage effect. Cooling effect tones vessel walls and increases skin elasticity, improves process of fat burning and detoxification, accelerates metabolism and removes excess water. Can be used for varicose veins, for pregnant women with swelling in legs. Ideal for facial contours correction. Ingredients: ex-tract of Dead Sea mud, natural menthol, natural camphor, collagen, allantoin, a mixture of natural essential oils: peppermint, green mint and lemon. 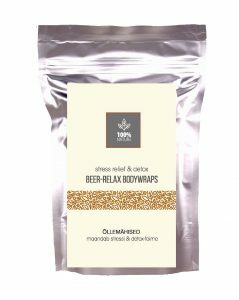 – Beer-relax wraps boosts metabolism, regulates sweating and stimulates fat burning, improves skin elasticity, helps in treatment of acne. B vitamins and mic-roelements contained in malt improve the immune system and body resistance, which is manifested in decrease in incidence of seasonal colds. Wrappings strengthen joints, warm up muscles, remove muscle tension, a sense of fatigue and, thanks to a mild soothing effect, perfectly relax. Beer wrappings are included in the programs of age-related changes correction, body tonifying, prevention and general health improvement. Ingredients: extract of Dead Sea mud, natural menthol, natural camphor, rye malt, barley malt, concentrated malt-hop extract. METHOD OF APPLICATION: conduct a body peeling, bandage problem areas and roll in film, leave for 30-40 minutes. Remove the bandages and apply moisturizing cream if necessary. It is recommended to combine with a lymphatic or other massage. After the procedure (depending on body size), a decrease in body volume from 2 to 6 cm is observed. 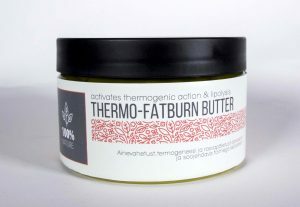 – Thermo-fatburn butter activates metabolism, stimulates the blood circulation and enhances lymphatic drainage. Promotes lipolytic processes in major cells of the adipose tissue where the cellulite occurs, boosting the fatburn process and weightloss. Active ingredients of butter as a fairly active effect, it works for several hours after the procedure, contributing to the body shape corrections. Active ingredients: jojoba oil, wheat germ oil, lemon wax, caffeine, red pepper oil CO2 extract. Application: apply a small amount of butter on problem areas with light massage movements. To increase the slimming effect, cover these areas with a film. Leave on for no more than 30-40 minutes. If necessary, wash off after treatment. For best results apply the butter prior the Cryo and Detox wrapping procedure.